Before even looking for your first house, you can get pre-qualified for a loan ensuring the rest of the process is hassle-free. We will help you get pre-qualified and on your way to home ownership! Contact one of our purchase specialists today to start your pre-qualification today. Call us at (508) 548-0177 or visit our free Purchase Assistant to get started! Working with Slade Mortgage Group, Inc.
Near or far, we will come to YOU. Owned and operated by proud Cape Codders for 20 years. 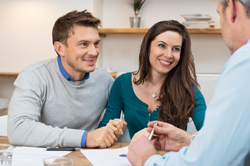 Our team has over 85 years of experience and we will work with you to meet your financial goals.